You should start preparing now for changes that GDPR will require to your current policies and procedures. The ICO has launch a dedicated advice line to help small organisations prepare for a new data protection law. People from small organisations should dial the ICO helpline on 0303 123 1113 and select option 4 to be diverted to staff who can offer support. As well as a dvice on preparing for the GDPR, callers can also ask questions about current data protection rules and other legislationregulated by the ICO including electronic marketing and Freedom of Information. GDPR Portal: This website is a resource to educate the public about the main elements of the General Data Protection Regulation (GDPR). In light of an uncertain 'Brexit' - I represent a data controller in the UK and want to know if I should still continue with GDPR planning and preparation? We advise full compliance with GDPR until further Governmental notice. 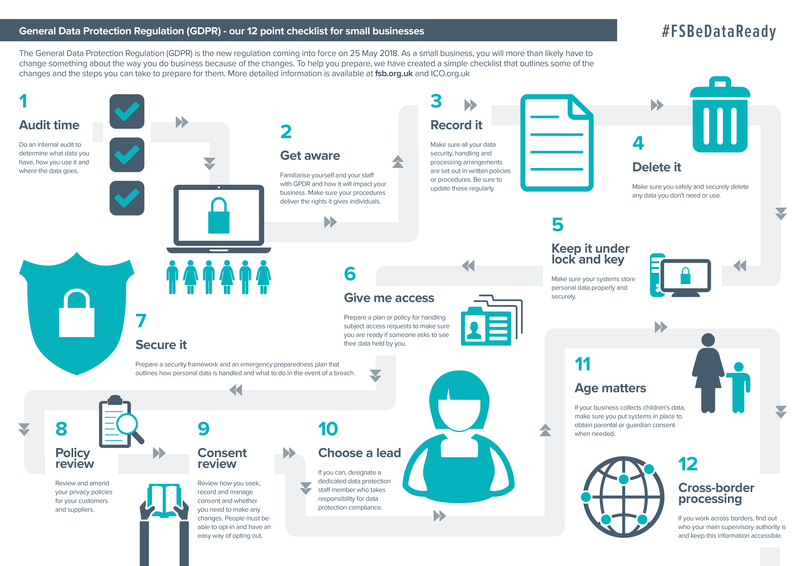 FSB (Federation of Small Businesses) GDPR preparation hub – Here you will find useful information and guidance on what the General Data Protection Regulation (GDPR) is and guidance on how to get GDPR ready.